The research I did for this topic was difficult because my resources had to be current and there just was not that many case studies on this specific topic. However, with the support of my professor and the librarian at Touro Library we were able to put some literature together. 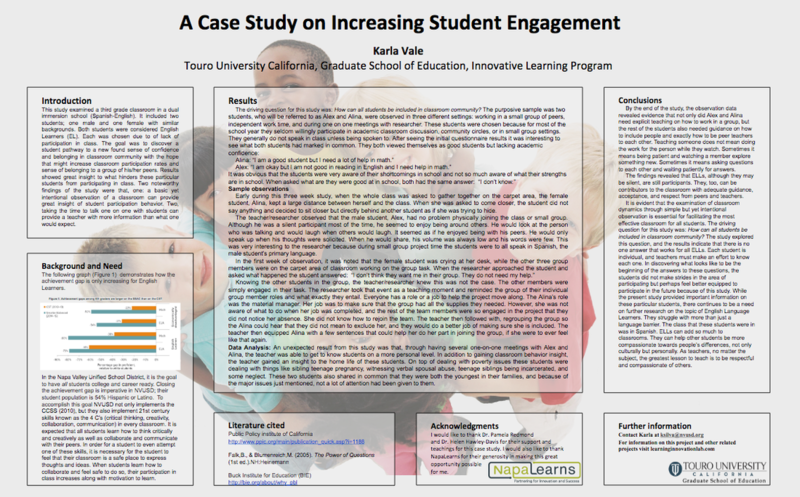 Follow this LINK for my full case study on the impact of establishing relationships on increased student engagement. ​"What is something that has been bothering you in your classroom?" Well, you see that student raising her hand? You see the other two that are just 'there'? That bothered me! I wanted to see all of my students eager to learn and participate. I didn't know why they were not engaged and that bothered me. I knew that had something special to contribute to our class. I studied a couple of them and my findings were really interesting. Follow this LINK to read my entire Literature Review for this study. Click on image below for a closer look at my research in poster form.